Titanium nitride (TiN) coated bits last up to six times as long as uncoated bits. 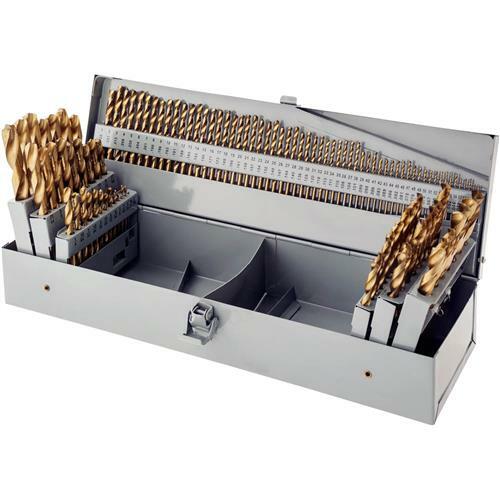 115-piece set features 29 fractional bits from 1/16" to 1/2" in increments of 1/64", letter bits from A to Z and 60 number bits. Housed in rugged steel case. Having all sizes of drill bits handy in the truck makes life easier. My only problem is that the case was damaged in transit and I have to find a similar case locally. This was a great buy for the quality of the product. I have never been disappointed with any purchase I have made from Grizzly. Keep up with the quality and competitive pricing,Thank you. Only used a few of the drills but they worked great. Only complaint is the drill bits are hard to remove from their respective spots. Can't be beat for the price. Would recommend to anyone seeking a complete drill set for non industrial use. I've seen "high carbon steel" sets that cost the same and might last for one use if you're careful. These appear to be high speed steel with the titanium nitride coating. I'm impressed.